Avignon has been inhabited since neolithic times dating from around 3000 B.C. and has for centuries found itself as a crossroads for commerce, culture, and the quest for power and control. The city has a long and rich history; it had been a Celto-Ligurian capital, a Phoenician colony with its own money with its name on it, AOYE; and then it became a wealthy Romanesque city, Avenio. It was known as one of 80 cities of Gaul under the Emperor Augustus, a Latin colony under Claude, before being promoted to the grade of Roman city during the IInd century under Hadrien. In 1309, Pope Clement V (originally from Bordeaux) came to Avignon and established the seat of the Papal Government because of insecurity in Rome. This event brought with it a newfound prestige to the city which lasted for almost a century with 9 popes calling Avignon home. Cultural, spiritual, economic and political capital of Christianity, Avignon became one of the most populated and wealthy cities in medieval Europe. Located between AVIGNON and ORANGE, Châteauneuf-du-Pape spreads out at the foot of the ruins of its fortress-castle. The village looks over the plain of Comtat and 3,000 hectares of vineyards. The village is almost completely dedicated to its world famous wine "Châteaunef du Pape" which is also part of the similarly famous CÔTES DU RHÔNE. 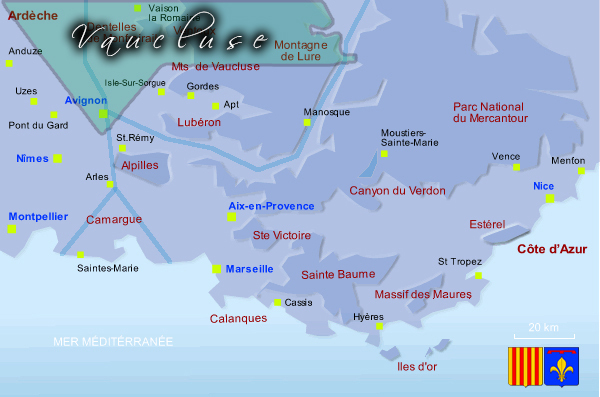 In the XIV century Pope Jean XXII chose Châteauneuf as the location for his summer residence, and then decided to plant grapevines on the stony land which surrounded the papal retreat. The wine production remained a secret for a long time, but started to become well known in the XVIII century. It was not until 1929 though, that it was officially recognized and bestowed with its own brand “Châteauneuf-du-Pape.” This brand or “appellation” as it is called in French means that the wine production in Chateauneuf du Pape is subject to strict controls that ensure that all the vineyards produce an extremely fine wine. Orange has a rich history dating back to the foundation of the town as Arausio by Roman Legionnaires between 30 and 35 B.C. It was during medieval times that the counts of Orange would take center stage; as either a friend of Charlemagne liberating the city from occupation or participating in the Crusades. Orange, become a principality with a parliament and one of its princes, William III, would become King of England. The city was doted with a palace-citadel until destroyed by the French King Louis XIV. Today, it is still possible to admire the Roman Triumphal Arch (circa A.D. 19) and the best preserved ancient roman theater in the western world measuring 103 meters long and 36 meters high. Only a few minutes from L’ISLE-SUR-SORGUE is Fontaine de Vaucluse, an amazing natural site that lies at the base of a steep cliffside and is considered by some the eighth natural wonder of the world. This resurgent spring gives birth to the river Sorgue, however, its exact underground source is still a mystery. What is certain and breathtaking, however, is when the “fountain” is, at certain periods in the year, jetting over 150 cubic meters of water per second. The small village is robed in lovely green cloak year round and was home to the poet Pétrarque and the infamous Marquis de Sade. L’Isle-sur-la-Sorgue is a wonderful little Provençal town of 18,000 inhabitants, located in the Venise Comtadine, in the heart of the modern French Department, or county, of VAUCLUSE. The old town, with many canals running through, has preserved a few traces of its past, thanks to a hydraulic system where water wheels are still working. However, what makes this town special is its market of provençal and antique goods each Sunday between 8:00 a.m. and noon. Vaison-la-Romaine, is a small town that has a lot of charm and history to boot. The town is split into two parts, and linked by a two-thousand year old Roman bridge. The lower town with the modern city alongside the vast Roman ruins where the town started; and the upper medieval town where the townsfolk took refuge from marauding forces following the collapse of the Roman Empire. Today, one is enchanted with this town’s extensive Roman ruins, including an amphitheatre; the medieval city with its castle, winding cobblestone streets, and fountains make this a place unlike most. In addition, the other hillside villages in the area with their castles, bridges, and breathtaking panoramic views make this area worth visiting.